Pomegranate Soap freshly poured and swirled. I don't mean that soap cures diseases. I do mean that soap has to cure, or age, before it's good to use. 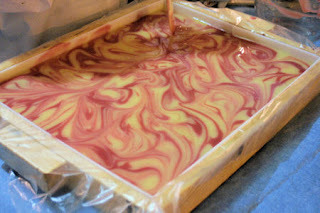 When we make a batch of Blissology soap, we can't just sell it the next day or even the next week. How long soap cures depends on a few factors. When soap is poured into molds, it's a thick liquid consistency - ideally. Sometimes particular fragrances will speed up the process and make it get thicker faster so sometimes we're glopping in soap that looks more like mashed potatoes. Even though it would still be okay to use, soap that moves too quickly sometimes ends up being cosmetically challenged or downright ugly. Large block of Angel of Shavano soap. In either case, we wait for about 12 hours before we try to unmold the soap. If we're using particular molds, we can often pop the whole thing in a warm (not hot) oven to make sure the saponification (making of soap) reaches the "gel" stage. We prefer to do it this way because the soap seems to become usable faster. We can shave off several days of cure time and get soaps back in stock sooner. Sometimes soap is still too soft after 12 hours to get it out of the mold or cut it without risking damage to the bars so we'll give it another day before trying again. What is best is after the first twelve hours, the soap is firm but not so hard that cutting is difficult. Once soap is out of the mold, it gets put into a tray to cure. 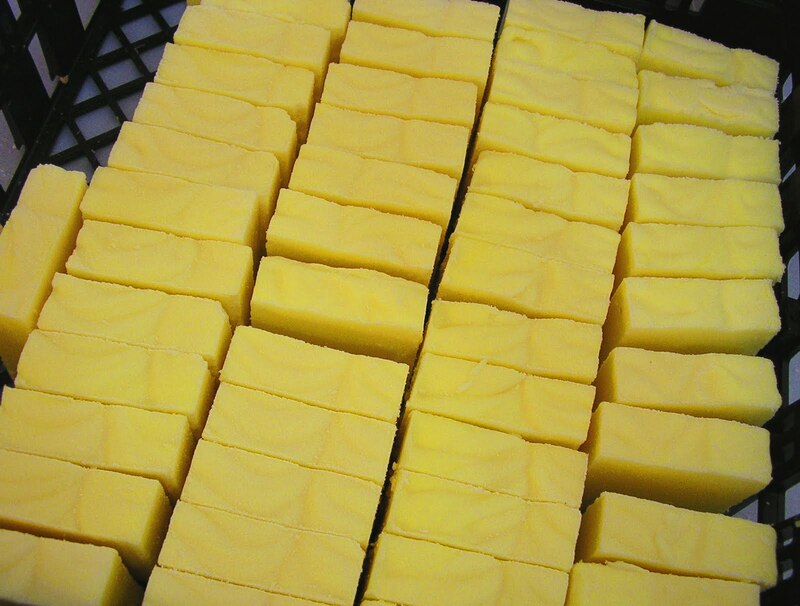 Beautiful Life soap cut and ready to cure. Blissology soap ages for about four weeks before it's ready to use. Some soap cures longer and some soap, like our Beautiful Life Spa bars, are ready much sooner. As the bars cure, they get harder and more mild. 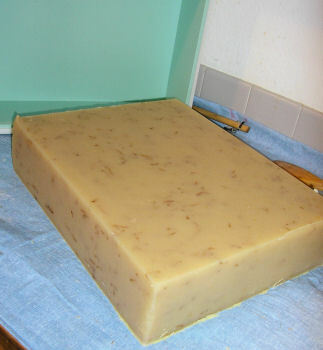 Very fresh soap hasn't completely finished saponifying so it can be harsh to skin. The longer soap ages, the more gentle it becomes. We wait as long as possible before packaging Blissology soap because it loses water as it cures and shrinks. If we wrap them too soon, the paper slides right off the bar. For this reason, we generally package days before a market or show and as orders come in. That in itself is a whole 'nother process! 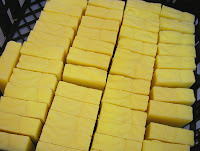 3 Responses to "Soap Cures"
Homemade soap does cure dry & itchy skin! What a great idea! DIY soaps are great!